Excerpts from the Brattleboro Reformer on Saturday July 20, 2013. Click HERE for full article. 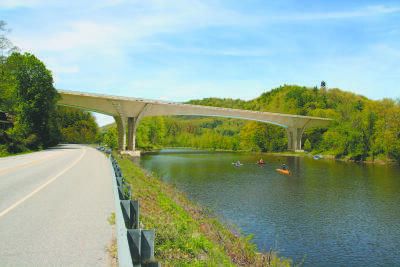 A $60 million project to replace the aging, deteriorated Interstate 91 bridge over Route 30 and the West River is scheduled to begin later this year. The two companies charged with designing and building the new span say they have created a signature gateway bridge that would capture the beauty of Vermont. The West River trail will serve as a construction access for the new bridge over Route 30, the companies said. However, administrators are pledging to “work diligently to maintain safe access through the trail right of way with minimal disturbances for trail users.” “Any construction activities near the trail will be communicated by means of mass e-mail, social media and physical postings at the trail entrances,” the companies said. “The safety of the public using the West River Trail during construction activities will not be compromised, and separation between construction traffic and (trail) users will be provided.” Temporary full closures of the trail will be necessary at certain times, but those will be coordinated with the Friends of the West River Trail, administrators said. A reminder that PCL Construction and FIGG Engineering Co., the contractors that are doing the I-91 bridge work for VTrans, will be relocating the utility conduit by the bridge during the week of July 29th. The trail near the bridge will need to be closed while the work is being done. This will take 3-5 days, from Monday, July 29 through possibly Friday, August 2. This entry was posted in west river trail and tagged I-91 bridge construction, trail closure, vtrans, west river trail. Bookmark the permalink.